Charles Cohen plays The Buchla Music Easel, an obscurity by pioneering synthesizer designer Donald Buchla. It speaks with a texturally complex voice. Sun Ra and the free jazz pianist Cecil Taylor shaped Cohen’s perception of electronic music as a freely flowing improvisational performance. 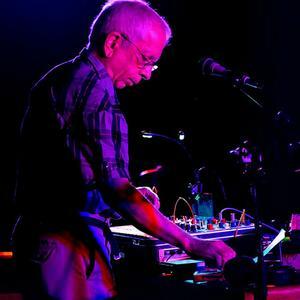 His experiences as an era-spanning member of Philadelphia’s avant-garde music scene, where he’s found kindred spirits from jazz to the scruffier side of electronic music, helped root his music in community and collaboration. Cohen began his career making scores for theater and dance productions and working as a sound designer at Temple University. His interests moved into improvisation the longer he played, drawing him away from more traditional composition and studio work and further into free jazz, cosmic music and noise. His approach to music these days is most closely linked to Pauline Oliveros, whose “deep listening” emphasizes a sensitivity to the unconscious over technique.